No participants were excluded from Study 1. We find the same effects when we analyze the full sample (N = 101, including the four participants excluded from the analyses reported in the main text). First, we find the effect of the disadvantaged-party condition on allocation decisions: Participants were more likely to give the extra $100 bonus to Allison when this choice disadvantaged the self (54%), compared to when it disadvantaged Jane (26%), χ2 (1, N = 101) = 8.58, p < .01; φ = 0.29. Second, the pattern of participants’ ratings of what others would think of them, had they made each type of decision, was very similar to that obtained previously. For ratings of perceived impartiality, the ANOVA revealed a main effect of decision, whereby giving the bonus to neither was rated as more impartial (M = 5.08, SD = 2.12) than giving it to Allison (M = 3.48, SD = 2.15), F(1, 99) = 22.36, p < .001, η2 = .18. Next, we found no overall difference in ratings between conditions (i.e., participants in both conditions rated the decisions as impartial to the same extent), p > .20. Importantly, however, a significant interaction occurred between condition and decision, F(1, 99) = 30.30, p < .001, η2 = .23. Specifically, when the self was not disadvantaged, the decision to give the bonus to neither was rated as far more impartial than the decision to give the bonus to Allison, F(1, 99) = 52.88, p < .001, η2 = .35, but no such gap existed when the resulting inequality would have disadvantaged the self rather than someone else, p > .50. For ratings of perceived envy, the ANOVA revealed a main effect of decision, whereby giving the bonus to neither (M = 3.68, SD = 2.14) was rated as more envious than giving it to Allison (M = 2.78, SD = 1.61), F(1, 99) = 10.77, p < .01, η2 = .10. The ANOVA revealed no main effect of condition on ratings of envy, p > .90. Yet condition interacted with decision, F(1, 99) = 6.26, p < .05, η2 = .06. Specifically, when the self was not disadvantaged, the decision to give the bonus to neither was rated similarly to the decision to give the bonus to Allison, p > .50, but when self was disadvantaged, the decision to give the bonus to neither (equal but inefficient) was rated as far more envious than the decision to give to Allison, F(1, 99) = 16.57, p < .001, η2 = .14. For ratings of perceived generosity,the ANOVA revealed a main effect of decision, whereby giving the bonus to Allison (M = 5.28, SD = 1.44) was rated as more generous than giving it to neither (M = 2.36, SD = 1.31), F(1, 99) = 264.14, p < .001, η2 = .73. We also found a main effect of condition, such that participants in the self-disadvantaged condition (M = 3.58, SD = 1.75) thought their decisions would seem more generous than participants in the third-party condition (M = 2.27, SD = 1.87), F(1, 99) = 32.76, p < .001, η2 = .25. A significant interaction also occurred between condition and decision, F(1, 99) = 13.13, p < .001, η2 = .12. Participants in the self-disadvantaged condition thought their decision to give to Allison would seem far more generous than their decision to give to neither, F(1, 99) = 195.60, p < .001, η2 = .66, and this gap was relatively smaller for participants in the third-party condition, F(1, 99) = 80.53, p < .001, η2 = .45. Finally, the mediation analysis yielded similar results to those obtained before. We started by testing appearance of impartiality as a mediator. First, the experimental condition self-disadvantaged had a significant effect on allocation (β = -0.61, p < .01). Second, the condition had a significant effect on appearance of impartiality (β = -1.85, p < .01). Third, in a regression analysis in which appearance of impartiality and condition were tested as predictors of allocation, appearance of impartiality was a significant predictor of allocation (β = 0.19, p < .01), but the condition was not a significant predictor (β = -0.30, p > .20). This result indicates that appearance of impartiality fully mediated the effect. The 95% bias-corrected confidence interval for the size of the indirect effect of condition on allocation through appearance of impartiality excluded zero (-0.73, -0.10), suggesting a significant mediation effect. A similar mediation analysis was run to assess the effect of condition on allocation through the appearance of envy. Here, the condition had a significant effect on appearance of envy (β = 0.69, p < .05). Appearance of envy was a significant predictor of allocation (β = -0.19, p < .05), and the condition was still a significant predictor (β = -0.52, p < .05), indicating a (marginal) partial mediation. The 95% bias-corrected confidence interval for the size of the indirect effect of condition on allocation through appearance of envy excluded zero (-0.34, -0.02), suggesting a significant mediation effect. A final mediation analysis was run to assess the effect of condition on allocation through the appearance of generosity. The condition had a significant effect on appearance of generosity (β = -0.65, p < .001). Appearance of generosity was a significant predictor of allocation (β = 0.32, p < .05), and the condition was now a marginally significant predictor (β = -0.45, p = .05). The 95% bias-corrected confidence interval for the size of the indirect effect of condition on allocation through appearance of generosity excluded zero (-0.53, -0.04), suggesting a significant mediation effect. We next tested a mediation model in which all three mediators were entered simultaneously. As noted earlier, all mediators were affected by condition. Yet only impartiality and generosity had unique effects on the allocation (β = 0.15, p < .05; β = 0.30, p = .07). The condition was no longer a significant predictor of allocation (β = -0.18, p > .40), suggesting full mediation. The 95% bias-corrected confidence interval for the size of the total indirect effect of condition on allocation through the three components of fairness excluded zero (-1.02, -0.18), suggesting a significant mediation effect. Thus, although appearance of envy seemed to mediate the effect when this measure was tested separately, it did not add to the mediation when tested simultaneously with impartiality and generosity as predictors. We find the same pattern of effects when we analyze the full sample (N = 246, including the 16 participants excluded from the analyses reported in the main text). In the standard-partiality conditions, participants were more likely to give the extra gift card to Allison when this choice disadvantaged the self (85%) than when it did not (45%), χ2(1, N = 81) = 13.64, p < .001; φ = 0.41. In the low-partiality conditions, participants were not any more likely to give the extra gift card to one of the employees according to a coin flip when this choice disadvantaged the self (79%) than when it did not (71%), χ2(1, N = 83) = 0.68, p > .40. In the high-partiality conditions, participants were not more likely to choose to give the extra gift card to Allison or to Jane when this choice disadvantaged the self (48%) than when it did not (45%), χ2(2, N = 82) = 0.09, p > .90. Thus, supporting our theory, the level of partiality associated with the decision setting appears to moderate the self-disadvantaging effect. To test our proposed mechanism, we examined participants’ ratings of what others would think of them, had they made each type of decision. 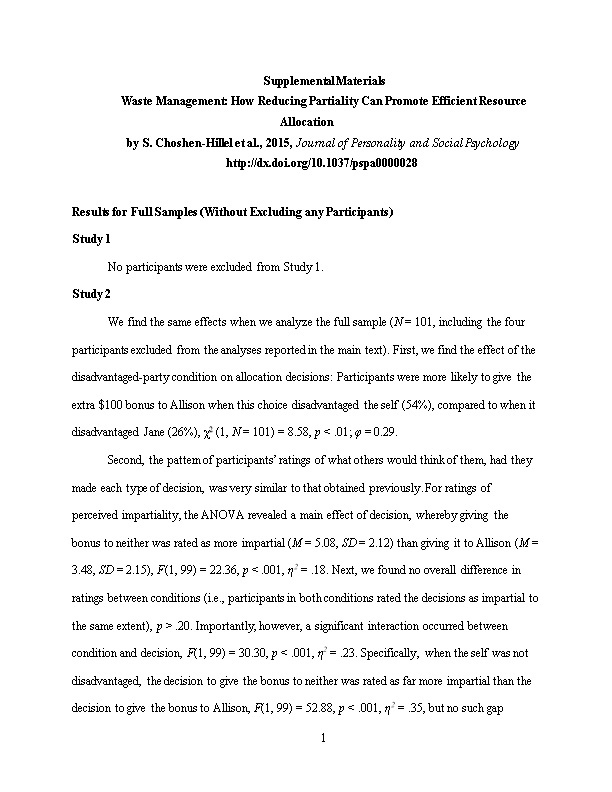 For each decision setting, we conducted a two-way ANOVA with role (self-disadvantaged or third party) as a between-participants factor and decision (giving the gift card to Allison or to neither) as a within-participants factor. The dependent measure was ratings of perceived impartiality. In the standard-partiality setting, we replicate the pattern of findings from Study 2. Importantly, a significant interaction occurred between condition and decision, F(1, 79) = 13.47, p .001, η2 = .15. In the low-partiality conditions, as predicted, no interaction occurred between condition and decision, F(1, 83) = 2.45, p > .10. Thus, the two decisions were similarly rated, regardless of whether the self was disadvantaged. In the high-partiality conditions, as predicted, no interaction occurred between condition and decision, F(1, 80) = 0.29, p > .50. Thus, whereas the two decisions were rated differently, whether or not the self was disadvantaged did not affect the rating. Next, we tested impartiality as a mediator of the effect of self-disadvantaging participants’ decisions. First, the experimental condition (self-disadvantaged or third-party) had a significant effect on allocation decisions (β = 0.95, p < .001). Second, the condition had a significant effect on appearance of impartiality (β = -1.24, p < .001). Third, in a regression analysis that tested appearance of impartiality and condition as predictors of allocation, appearance of impartiality was a significant predictor of allocation (β = -0.36, p = .001), and the condition was a significant predictor (β = 0.70, p < .05). This result indicates that appearance of impartiality partially mediated the effect. The 95% bias-corrected confidence interval for the size of the indirect effect of condition on allocation through appearance of impartiality excluded zero (0.14, 0.95), suggesting a significant mediation effect. Across all allocation settings, the fairness ratings showed a similar pattern to the impartiality ratings. Importantly, for fairness ratings as well, for the standard-partiality setting, we found an interaction between condition and decision, F(1, 79) = 17.80, p < .001, η2 = .18, but not for the high-partiality setting, F(1, 80) = 0.12, p > .70. The only difference here was that we did find an interaction for the low-partiality setting, F(1, 81) = 7.42, p < .01, η2 = .08. Additionally, ratings of fairness mediated the effect in the standard allocation setting. The condition had a significant effect on appearance of fairness (β = -1.55, p < .001). In a regression analysis that tested appearance of fairness and condition as predictors of allocation, appearance of fairness was a significant predictor of allocation (β = -0.52, p < .001), and the condition was not a significant predictor (β = 0.53, p > .10). This result indicates that appearance of fairness fully mediated the effect. The 95% bias-corrected confidence interval for the size of the indirect effect of condition on allocation through appearance of fairness excluded zero (0.38, 1.50), suggesting a significant mediation effect. Finally, participants found the decision to give the (soon-to-expire) gift card to no one very wasteful (M = 5.92, SD = 1.59), rating it as more wasteful than the midpoint of the scale (4), t(245) = 18.97, p < .001. We find the same effects when we analyze the full sample (N = 2383, including the 738 participants excluded from the analyses reported in the main text).First, consistent with our hypothesis, participants were more likely to vote to pay future participants 90 cents (instead of 75 cents) when those participants were going to complete the same survey that they had completed (i.e., the self-disadvantaged condition, 54%) than when they were going to complete a different survey (i.e., the third-party condition, 48%), χ2 (1, N = 2374) = 7.58, p < .01; φ = 0.06. Second, the pattern of participants’ ratings of how impartial, envious, and generous they would appear, had they made each type of decision, was similar to that obtained previously. We conducted a two-way ANOVA with condition (self-disadvantaged or not) as a between-participants factor, and decision (giving a higher payment or not) as a within-participants factor. For ratings of perceived impartiality, the ANOVA revealed a main effect of decision, whereby paying future participants the same as past participants was rated as more impartial (M = 4.35, SD = 1.62) than paying them more (M = 4.17, SD = 1.72), F(1, 2376) = 11.30, p < .01, η2 = .01. Next, we found no overall difference in ratings between conditions, p > .70. Importantly, however, a significant interaction occurred between condition and decision, F(1, 2376) = 54.28, p < .001, η2 = .02. Specifically, when the self was not disadvantaged, the decision to pay the future participants the same was rated as more impartial than the decision to pay them more, F(1, 2376) = 57.76, p < .001, η2 = .02. This gap was much smaller when the resulting inequality would have disadvantaged the self rather than only others, F(1, 2376) = 7.99, p < .01, η2 = .003. For ratings of perceived envy, the ANOVA revealed a main effect of decision, whereby paying future participants the same as past participants was rated as more envious (M = 3.69, SD = 1.69) than paying them more (M = 3.29, SD = 1.74), F(1, 2380) = 73.17, p < .001, η2 = .03. Next, we found no overall difference in ratings between conditions, p > .30. Importantly, a significant interaction occurred between condition and decision, F(1, 2380) = 34.32, p < .001, η2 = .01. Specifically, when the self was not disadvantaged, the decision to pay future participants the same was rated similarly to the decision to pay them more, F(1, 2380) = 3.64, p = .06, η2 = .002, yet when the self was disadvantaged, the decision to pay them the same was rated as more envious than the decision to pay them more, F(1, 2380) = 103.87, p < .001, η2 = .04. For ratings of perceived generosity, the ANOVA revealed a main effect of decision, whereby the decision to pay future participants more was rated as more generous (M = 5.27, SD = 1.38) than paying them the same (M = 3.52, SD = 1.49), F(1, 2381) = 1675.91, p < .001, η2 = .41. We found no overall difference in ratings between conditions, F(1, 2381) = 0.03, p > .80, and the interaction between condition and decision was also not significant, F(1, 2381) = 1.19, p > .20. We next analyzed participants’ ratings of how wasteful the decision was to pay the future participants the same as past participants, rather than more. As before, we found no overall difference in ratings of wastefulness between conditions, F(1, 2360) = 1.68, p > .10. Finally, the mediation analysis yielded similar results to those obtained previously. First, for impartiality, the experimental self-disadvantaged condition had a significant effect on allocation (β = -0.11, p < .01). Second, the condition had a significant effect on appearance of impartiality (β = -0.40, p < .001). Third, in a regression analysis that tested the appearance of impartiality and condition as predictors of allocation, appearance of impartiality was a significant predictor of allocation (β = 0.23, p < .001), and the condition was not a significant predictor (β = -0.03, p > .40). This result indicates that appearance of impartiality fully mediated the effect. The 95% bias-corrected confidence interval for the size of the indirect effect of condition on allocation through appearance of impartiality excluded zero (-0.12, -0.06), suggesting a significant mediation effect. Thus, in line with the results of the previous studies, impartiality mediated the self-disadvantaging effect. A similar mediation analysis was run to assess the effect of condition on allocation through the appearance of envy. Here, the condition had a significant effect on appearance of envy (β = 0.28, p < .001). Appearance of envy was a significant predictor of allocation (β = -0.15, p < .001), and the condition was a marginally significant predictor (β = -0.07, p = .07), indicating a (marginal) partial mediation. The 95% bias-corrected confidence interval for the size of the indirect effect of condition on allocation through appearance of envy excluded zero (-0.06, -0.03), suggesting a significant mediation effect. Another mediation analysis was run to assess the effect of condition on allocation through the appearance of generosity. The condition had no significant effect on appearance of generosity (β = -0.05, p > .20), such that appearance of generosity could not mediate the effect. We next tested a mediation model in which all three potential mediators were entered simultaneously. The condition had a significant effect only on appearance of impartiality and of envy (βs = -0.39 and 0.29 respectively, ps < .001). Both impartiality and envy had a unique significant effect on the allocation (βs = 0.21 and -0.11 respectively, ps < .001). The condition was not a significant predictor of allocation (β = -0.01, p > .80), suggesting a full mediation. The 95% bias-corrected confidence interval for the size of the total indirect effect of condition on allocation through the four components excluded zero (-0.17, -0.10), suggesting a significant mediation effect. No participants were excluded from Study 4b. We find the same effects when we analyze the full sample (N = 161, including the 23 participants excluded from the analyses reported in the main text). First, a manipulation check confirmed in-group favoritism. A binomial sign test revealed that when participants were asked to choose who would receive an extra bonus, they were more likely to give it to an in-group member (75%) rather than an out-group one (25%), p < .001. Next, we conducted a logistic regression analysis with self-disadvantage (self-disadvantaged or third-party) and recipients’ group identification (in-group or out-group) as independent variables, and choice as a dependent variable. The regression revealed a significant effect of recipients’ identification, whereby participants were more likely to give the extra gift card to Allison when the recipients were in-group members (74%) than when they were out-group members (59%), χ2(1, N = 161) = 5.39, p < .05. The regression also revealed a significant effect of self-disadvantage, whereby participants were more likely to give the extra gift card to Allison when this choice disadvantaged the self (86%) than when it did not (45%), χ2(1, N = 161) = 37.94, p < .001. Importantly, the interaction between self-disadvantage and the recipients’ identification was not significant, χ2 (1, N = 161) = 0.53, p > .40. Indeed, we find a significant self-disadvantaging effect in both the in-group (93% vs. 53%, χ2(1, N = 80) = 16.68, p < .001, φ = 0.46) and out-group conditions (79% vs. 37%, χ2(1, N = 81) = 14.90, p < .001, φ = 0.43), suggesting that group membership alone does not drive the increased giving produced by the self-disadvantaging effect. We find the same effects when we analyze the full sample (N = 245, including the 25 participants excluded from the analyses reported in the main text). First, we confirmed that participants felt more control over the allocation when they were asked to choose how to allocate the gift cards (M = 5.98, SD = 1.58) than when they were asked about their satisfaction with another person’s allocation (M = 3.84, SD = 2.36), t(242) = 8.37, p < .001. This result reveals that we successfully manipulated participants’ sense of agency in the decision process. Next, a 3x2 chi-square test revealed that self-disadvantage had a significant effect on participants’ choices, χ2(2, N = 245) = 71.60, p < .001; φ = 0.54, both in the agency condition (χ2(2, N = 123) = 32.48, p < .001, φ = 0.52) and in the no-agency condition (χ2(2, N = 122) = 46.09, p < .001, φ = 0.62). To test whether participants in the self-disadvantaged conditions wasted fewer resources than participants in the third-party conditions, we compared the rate of giving the gift card to neither in the different conditions. Indeed, participants in the self disadvantaged condition chose to give the gift card to neither only 15% of the time, whereas participants in the third-party condition chose to give it to neither 64% of the time, χ2(1, N = 245) = 59.65, p < .001, φ = 0.49. The same pattern appears both in the no-agency condition, χ2 (1, N = 123) = 31.03, p < .001, φ = 0.50 and in the agency condition, χ2 (1, N = 122) = 28.24, p < .001, φ = 0.48. To test whether participants in the self-disadvantaged condition wasted less because they chose the efficient unequal option that would advantage them, we compared the rate of creating “non-selfish inequality” between the conditions. We conducted a logistic regression with self-disadvantage (self-disadvantaged vs. third-party) and agency (agency vs. no agency) as independent variables, and the rate of choosing non-selfish inequality as the dependent variable. The regression revealed a significant effect of recipients’ agency, whereby participants were more likely to favor non-selfish inequality when they were involved in creating the allocation (agency, 43%) than when they were not (no agency, 26%), χ2(1, N = 245) = 9.58, p < .01. The regression did not reveal a significant effect of self disadvantage, χ2(1, N = 245) = 1.59, p > .20. However, the interaction between self-disadvantage and agency was significant, χ2(1, N = 245) = 8.25, p < .01. We followed up this interaction with a 2x2 chi-square test. Importantly, participants were much more likely to choose the option that benefitted someone else in the agency/self-disadvantaged condition (48%) than in the no-agency/self-disadvantaged condition (15%), χ2(1, N = 119) = 17.43, p < .001; φ = 0.36. Thus, although people prefer to give an extra resource to others when they themselves are deciding, they prefer that someone else gives more to them.